Sometimes, stylish & sociable Miami shopping sounds better than sun & sand. 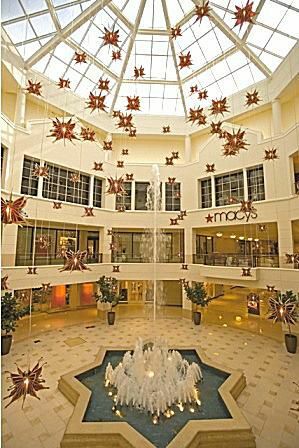 Aventura Mall: What Makes It Special? Aventura Mall is an amazing shopping and lifestyle experience near Miami. It is one of the very best malls in South Florida, Miami’s premier fashion destination, and one of America’s most visited shopping centers according to Travel + Leisure magazine. Aventura Mall offers 2.7 million square feet of retail action. Its collection of upscale boutiques and more than 300 of the world's most iconic retailers tempt with every kind of shopping imaginable, from the Apple Store to Victoria's Secret. The mall is open Monday through Saturday, 10:00 a.m. to 9:30 p.m., and Sunday, 12:00 p.m. to 8:00 p.m.
Aventura Mall's lifestyle options include nearly a dozen restaurants; an Equinox gym; day spas and beauty salons; Kidz Aventura Mall activities, including an artist-designed interactive playground; and a taste of South Florida’s thriving arts scene with Arts Aventura Mall, featuring contemporary installations by renowned international and local artists. For your entertainment, you can see the latest movies at the 24-screen AMC Movie Theatre with IMAX. • Foreign Visitor Assistance in Spanish, Portuguese, Creole, etc. • Events such as Farmer's Market, P.A.W.S. Not everyone goes to Aventura Mall to shop, or to catch a bite or a movie. They go to literally chill out. Aventura is mainly indoors, with splendid air-conditioning that's a vacation from the broiling South Florida sun. But Aventura Mall has plenty of outdoor spots, such as dining patios, to enjoy the Sunshine State weather when it's not too hot out. Aventura Mall is set in the community of Aventura between Miami and Fort Lauderdale, on the Dade County-Broward County border. The mall is extremely easy to drive to and to find: it is on the central, north-south Biscayne Blvd. (the famed US 1) near where it merges with the Dixie Highway. You Will Find a Parking Space! Aventura Mall has nearly a thousand covered parking spaces. Most are free, but valet parking is available for a low fee. Aventura Mall hosts Apple, Michael Kors, H&M, Tory Burch, Sam Edelman, Microsoft Store, Urban Outfitters and other shopper favorites. For a full and up-to-date directory of the shops at Aventura Mall, visit their website. Aventura Mall offers a variety of dining, from national brands to only-here restaurants and sit-down restaurants to casual eats. For a full and up-to-date directory of the restaurants and at Aventura Mall, visit their website. Please note: Info about Aventura Mall stores and other details were correct at the time of publication, but are subject to change.